There’s a time and a place for light lines, delicate tackle, and tactful fishing. Then there are times when you just want the no holds barred strongest fishing line money can buy. We won’t question why. Maybe you want to create a booby trap, or perhaps you just want to make sure you never lose your favorite lure. The reasons why are your own. The title for the strongest fishing line might be slightly contentious, as technically you could use steel cabling to catch a fish, but that wouldn’t be fair. So, we’re going to say that to qualify, the fishing line needs to widely available to the public. We’re also going to exclude leader lines. With that out of the way with, the strongest fishing line you can get on the market today is a braided line. It’s easy to buy braided line rated for 550lbs or more, while monofilament tends to max out at around 300lbs. I should caveat this statement by saying monofilament leaders are available in 600lbs plus. So, there you have it, braided lines are very strong and available everywhere you buy your fishing gear from. If you’d like to see some of the strongest fishing lines available on the market and find some more information on fishing lines, then read on. Why Does Line Strength Matter? Does Fishing Line Color Matter? These aren’t necessarily the strongest in the sense of test breakage, but most of these offer excellent performance to size. Dorisea Extreme Braided fishing line is a braided fishing line. It is made up of plaited microfibers. Braided fishing lines are thin even though they are strong. This fishing line fits perfectly on the spool due to its thin size. Its line memory is very low and it sinks faster. 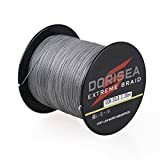 Dorisea fishing lines are very popular. It doesn’t breakdown when exposed to sunlight. It is very smooth and has high sensitivity. It is cheaper than other braided fishing lines. It is available in many colors. Some of them are –> hi-vis yellow, vermilion red, moss green etc. Monofilament fishing lines have good knot strength and high abrasion resistance. 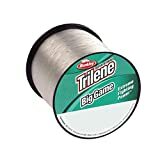 Berkley Trilene big game monofilament custom spool is an affordable fishing line. It can be used in freshwater as well as in salt water. It is available in three colors –> coastal brown, transparent and steel blue. Sufix tritanium plus is a copolymer fishing line. It is similar to monofilament fishing lines. It is made with distinct nylons. It has reduced line memory and higher abrasion resistance. They are elastic in nature and hence they are suitable for anglers which want to do fishing in deep water. It sinks better in deep water. The best thing about this fishing line is its reduced line memory. It is available in three colors –> transparent, dark green and chartreuse. 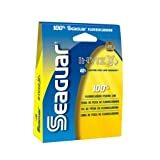 Seaguar invizx fluorocarbon 200 yards is a fluorocarbon fishing line. The best thing about fluorocarbon fishing lines is that it is invisible to the fishes under the water, but visible to the angler above the water and refracts light as well. It has high durability and abrasion resistance. This fishing line is a good option for those anglers which do fishing in fresh water. It is heavier than monofilaments fishing lines. 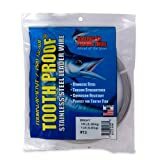 American fishing wire tooth proof stainless steel leader fishing line is useful when anglers want to seize those fishes which have sharp teeth and might cut the fishing line. This fishing line is satisfactory for freshwater as well as for salty water. It is corrosion resistant, flexible, hard and has good strength. This fishing line is available in two colors –> camo brown and bright brown. Why we should check the strength of the fishing line before fishing? The strength of a fishing line means how much load or stress it can tug or pull. If we try to pull a weight more than its strength capacity, the line will break. So, basically, the strength of a fishing line is the maximum load or weight it can take. It is most often measured in pounds. Why we should consider the weight of the string line? The weight of the line is important because it depends on the type of fishes we are looking for. For example, if we want to catch fish which are heavy in weight or fierce fighters, then we should choose those fishing lines which are capable of pulling fishes of such weights. If we want to catch fish which are lighter in weight, then a fishing line with a lighter weight is sufficient. Typically, larger fish will require a fishing line of 17 – 40 pounds would be ample; for lightweight fish, lines of 1 – 12 pounds would be enough. The lighter the line, the higher the chance of catching a fish. The color of the string also affects fishing. Some anglers choose fishing lines which are visible clearly under water. The reason behind choosing such type of fishing lines is that anglers are able to see the movement of the line clearly. Some anglers, however, do not prefer such type of fishing lines because they are visible to fish too. This makes fish alert and may spook them. Anglers should choose the color of fishing lines according to the place where they are fishing. For example, they can use fishing lines of green color in the places where vegetation is dense. So that the green color will blend with the color of vegetation. This helps the line blend in with the surrounding habitat. They might think that the line is natural. Monofilament fishing lines are those types of fishing lines which use yellow, red, green and transparent colors as fishing line colors. We have discussed above which type of environment these colors should be used accordingly. Braided fishing lines use two combinations of colors according to the type of water. Green and bronze: These two colors are used when anglers wish to fish in an area where the water is salty. Green and bronze colors are not visible under salty water. So, when anglers don’t want the fishing line to be visible, then they can opt for this option. Red and yellow: These two colors are clearly visible under the water. So, if anglers want the fishing line to be visible for tracking the movement of the line, then they can go for this option. Fluorocarbon fishing lines are those fishing lines which are almost invisible or transparent. Anglers can go for pink color If they are doing fishing in deep water. The deeper you go, the more the pink color will fade away and it eventually becomes transparent for fishes even though you can track the movement of your line as it will be visible to the angler from the outside.